superb book well written Dean Koontz is a master writer - edge of the seat stuff ! Flashlight required to finish this book! Dean Koontz is master story teller!! I'll admit that I wished this dog Einstein is MY dog! I'd be thrilled to death to hyave this dog who can "talk" to you via scrabble tiles! I don't want to ruin this story but... YOU got to read this and turn this book into family classic if you want to. I will keep this book and encourage my kids to read it and then encourage their future children to read it too! Einstein is no ordinary dog. Escaped from a research facility he is taken in by a guy who finds him running stray in the woods and who slowly finds out there is much more than meets the eye to this remarkable canine. Einstein is smart. Very smart. But he is also not alone in escaping from the researchers as his alter ego is also out there. The failed experiment, the Other, designed to kill, hideously ugly and burning with hatred and self loathing. It wants nothing more than to rip Einstein to shreds for being everything it isn't and it is tracking Einstein and by association, his new 'masters' - although, friends is a better word, as this dog is more human than most humans. 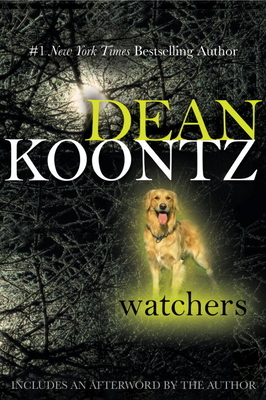 Watchers is, like I said, my favorite Koontz book, due mainly to the ingenious characterisation of Einstein. I defy anyone not to fall in love with this dog before the book is over. There's a great fast-moving page-turner of a book here to. A little gory in places perhaps as the Other is nothing short of a genetically enhanced killing machine and hates humans almost as much as he hates Einstein, but a great read nonetheless. Koontz is a master of creating fast moving suspenseful novels and if you like his other books you'll love this one - and if you've never read one before then you'll soon be a fan if you start here. A must read for all golden lovers!!! Another thrilling story from Dean Koontz. It's hard to put this book down. You just can't wait to find out how it's going to turn out. If you are a golden retriever lover, like me, you'll absolutely love it. I went back and bought a first edition for my collection! If you love dogs, read this for sure? Imagine being a little boy playing in the woods when he meets a lovable dog. As the boy gets to know the dog, and the dog him, the boy realizes that this is no ordinary animal. It seems as if the dog is actually trying to teach the boy. As the plot unfolds the dogs opposite is revealed. A most sinister beast, plagued by mental anguish over what the government testing agencies have done to him, and filled with this compelling urge to rip his "good side", Einstein the Dog, to little, tiny, blood-soaked bits, wreaking havoc throughout the countryside as he encounters innocent farmers, and their daughters, and attempts to carry out his subconscious military goal of getting behind enemy lines and causing mass chaos and destruction, including murder. Take your blood pressure pills BEFORE reading this book each night. And be prepared to introduce yourself to the following morning's light since this is a book that you will not easily put down.